Overseeing the financial performance of the school and making sure its money is well sent. In practice this usually involves scrutiny and supervision of the Head Teacher’s recommendations. 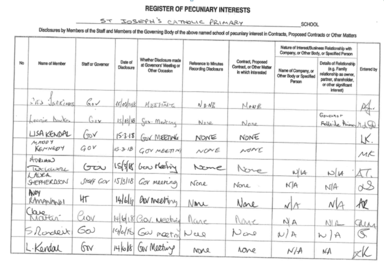 However all of the above are ultimately the responsibility of the governors. The committee structure of our school is the mechanism through which governor’s carry out their remit of supporting and challenging the Head Teacher and Staff to deliver the vision for the school and to provide high quality teaching and learning environment for pupils. The structure reflects the schools priorities with priority given to the curriculum provided and the performance of pupils. Curriculum & Pupil Performance Committee – Chair Miss L Shepherdson, Vice-Chair Mrs L Kendal, meets termly and focuses on the curriculum, pupil attainment and progress including SEND and pupil premium and the impact of interventions. Resources Committee – Chair Mrs A Connelly, Vice-Chair Cllr S Ronchetti, meets termly and focuses on ensuring that the school sets and uses its budget appropriately and ensures staffing levels meet the needs of the children. This committee also ensures that the school premises are kept in good condition and the school grounds are developed to enhance the learning experiences of the pupils. 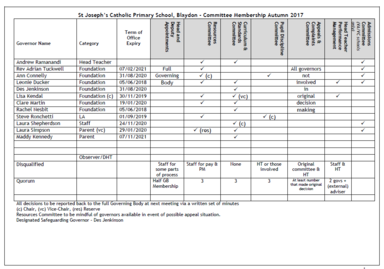 Other Committees, we also have specific committees which meet as and when required which include, Pupil Disciple, Appeals & Complaints, Head Teacher’s Performance Management, Admissions and Governing Body Self Review. The Chair of Governors meets regularly with the Head Teacher, discussing relevant issues, supporting and at times providing challenge across a range of areas. All governors monitor key areas across the school with a specific focus on ensuring progress is made towards strategic goals and priorities laid out in the School Improvement Plan.